Device uses patented technology to help pets lose weight by controlling both portions and access. Eighty-seven percent of overweight pets lost weight during successful field trials. Didn’t see us at VMX? Click here for a video of our display and veterinary reactions. 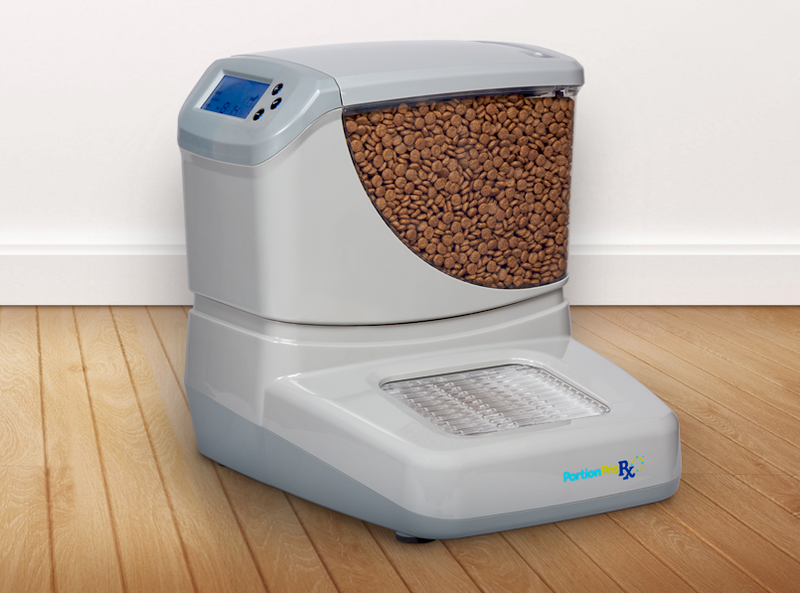 The PortionPro Rx is an intelligent pet feeder that uses proprietary access-control technology to ensure that dogs and cats follow prescription diets and prevent food theft between pets in multi-pet households. overweight dogs and a 169% increase in overweight cats since 2007. What Makes the PortionPro Rx Different? food for the assigned pet to control overeating. prevent food theft between pets. • 87% of overweight pets lost weight during the trial. • 97% of pet owners said food stealing between pets was eliminated. • 83% of pet owners said it was easier to follow a prescription diet. • 86% of pet owners saw reduced stress and frustration at mealtime. PortionPro Rx. For more information, visit https://portionprorx.com/get-started/. vetinnovations.com. Follow us on Twitter (@vetinnovations) and LinkedIn.